If you can’t find julienned bamboo shoots, buy sliced ones and cut them into narrow strips and if you’d like a thicker soup, dissolve 2 tablespoons cornstarch in 3 tablespoons water. Stir into hot soup and cook until thickened before ladling it over the noodles. Cook noodles according to package directions. Drain and divide between 4 large soup bowls. Heat 1 tablespoon oil in wok or soup kettle over medium-high heat. Add chicken, ginger, and chili-garlic sauce. Cook and stir 3 minutes. Remove from pan to plate. Add remaining 1 tablespoon oil to pan; add mushrooms, bamboo shoots, and bean sprouts. Cook and stir 2 minutes. Return chicken mixture to pan; pour in soy, vinegar, and broth. Bring soup to a boil; reduce heat and simmer 10 minutes. 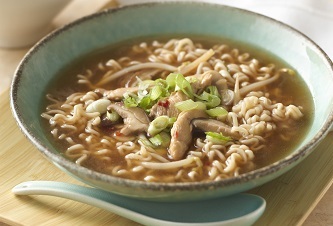 Ladle soup over noodles; garnish with a drizzle of sesame oil and sprinkle with cilantro and green onions. it's best to thaw before cooking.